Bye Bye To Your Democratic Rights! Since this September 2013 meeting, the Local Laws Advisory committee has only met on 3 occasions – 9th April 2014; 3rd December 2014; 18th May 2015. The 2015 members of this committee were – Lipshutz, Hyams, Okotel and Lobo! Need we say more? Thus 3 meetings in two and a half years to come up with this nonsense! After years and years of promising to amend the Local Law there is finally an agenda item that proposes to further erode residents’ democratic rights and to make it even harder to get answers out of council. Submissions will be called for so we urge all residents to take particular notice of what is proposed and to think carefully what this will mean for transparency and accountability in Glen Eira. Agenda items are posted online on Friday after 12pm. Public questions can currently be emailed to council by 12pm of the day of the council meeting (ie Tuesday). The proposal is to reduce this deadline by 24 hours (ie Monday 12pm). Even if the argument is that officers require more time to answer questions, surely this impediment can be overcome simply by publishing the agenda well before Friday afternoon so that residents can read the agenda and get their questions in earlier? Plenty of other councils publish their agenda a week prior to the formal council meeting –(Bayside, Stonnington for example). Any question that is now over 150 words WILL NOT BE ACCEPTED. Previously the wording was ‘should be 150 words’ and to the best of our knowledge, no question was rejected which contained more than 150 words. Whilst some may argue that good questions should be able to be submitted below this number, there surely are occasions when detail is required and questions exceed 150 words? What this also means is that questions over 150 words will NOT BE RECORDED IN THE MINUTES. Another blow to accountability! Even the quarterly report will now only record those question read out and not the number asked! What is extraordinary about this report is that not a single word of justification for any of the recommended changes is provided. Why council (or rather the stacked Local Laws committee) considers any of these changes necessary and beneficial is anyone’s guess. We have no doubt that these changes are to the detriment of open and accountable government – rather ironic we feel when the state government is currently reviewing the Local Government Act with the stated intention of improving governance! We also remind readers that Delahunty is on this advisory committee! Thus for all the promises of amending the Local Law in terms of the ‘unauthorised sporting groups’ (aka the Frisbee affair) and basic questions of Notice of Motion, that this is all that the Local Laws committee could come up with after years and years of ‘consideration’ is a disgrace. It is even more disgraceful that not a single word of justification is provided in the Corporate Counsel’s report as to why such changes are deemed to be necessary and why the new CEO has permitted such a report to even go out as the official record! All this means is the further erosion of good governance in Glen Eira and the resolve to diminish public participation even further. The changes are discriminatory and make matters even worse. Not everyone has got a computer to email questions off. If they have to rely on the post there is no guarantee that even if they mail something on Friday it will get there by Monday before 12. People also work so they may not see the agenda until late Friday and they work on Monday. Again getting question in over the weekend is not going to suit everyone especially those who want to drop their questions in by hand and the offices are closed on the weekend. I agree with the post. Agendas should come out a lot earlier so that people can read them. When planning applications are the issue then things are even worse. The officers recommend a permit and that means that councillors have to be hassled on the weekend. I don’t like doing that but have been forced to because of the way that council works. It is ridiculous and not consumer friendly. 150 words isn’t a lot to get a point across either and to ask something. Many of the lxra questions were over 150 words. If this was in now then more than half of the questions would be out the window. I don’t see why you have to be in the chamber to get your question answered and not when questions are always last. That means that you would have to sit through some interminable discussions that could go on for hours before you get to the questions. Answers to questions should happen first and not last. I cannot see any of this being good for public participation. I guess that is exactly what some of these councillors want. The report makes the claim, without evidence, that the Local Laws Advisory Committee has “identified the need for amendments”. The “need” for any of the changes isn’t stated. On the basis that no evidence in support of the motion has been provided, competent and ethical councillors should vote against it. Any councillor tempted to vote for it should explain just how the changes satisfy the key facilitating objectives of councils under the Local Government Act eg how it ensures transparency and accountability in Council decision making. Wonder what GECC’s definition of a “word” is? Public questions are an important part of governance—much more important than some councillors regard them. Embarrassment shouldn’t be a reason for Council to suppress their responses from the public. If Council engages in questionable behaviour then Council should be questioned. Having a public record of what Council’s views are on matters of public policy is valuable. The proposed changes to Local Law have not been carefully considered and should be substantially modified or rejected outright. Council should NOT be asked to endorse something that lacks justification. What happens when a question has got a couple of sub questions but still on the same topic? The post from 2013 has got Lipshutz saying that this will be taken as more than 2 questions. What they are proposing is as clear as mud and it shouldn’t be. You should be able to ask as many questions as you like and council or councillors should have to answer them. Lipshutz has successfully gagged councillors now all he and his mates are trying to do is gag residents. 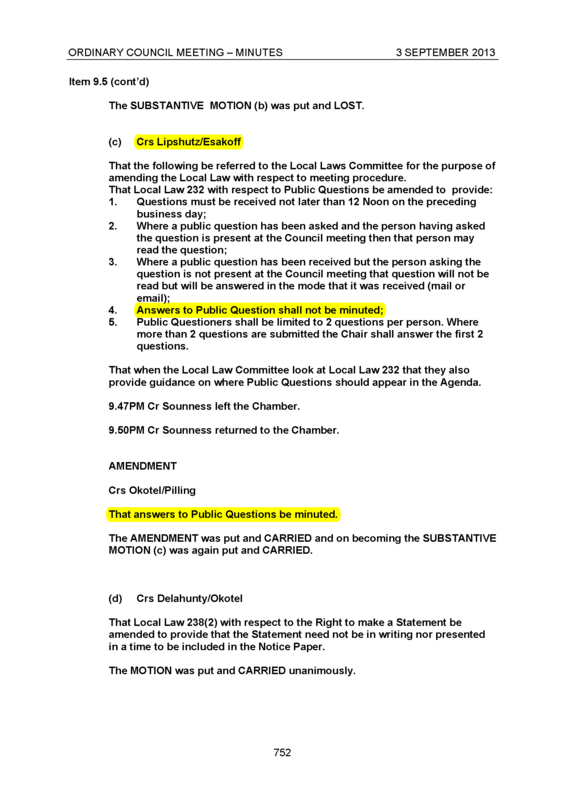 On a related question (audio recording of council meetings) which was ‘debated’ at council in September 2013, we note once again how resolutions mean nothing in Glen Eira, and how issues are allowed to disappear and not be reported upon. The Burke argument against having audio recordings was that any infrastructure might ‘damage’ heritage aspects of the town hall building!!!!! That is why of course, council has allowed certain groups to install antennaes on this ‘heritage’ building post this discussion! A request for a report was passed unanimously at the September 2013 that officers prepare a report on what other councils are doing regarding audio recordings. This report has never been tabled at a council meeting, nor does it feature in any of the records of assembly. DELAHUNTY: said that there had recently been a ‘flurry’ of councils providing recordings and videos of their council meetings. ‘I think it’s a great idea’. If people can’t show up to the meeting then they can watch it at their leisure. It will also help people ‘understand the values we impart’ and ‘how we come to a decision’ and ‘helps with participation’. Not fully supportive of visual recordings but if the issue is to be investigated then ‘might as well’ have all the information up front. ‘What’s said is most important’. It’s ‘moving into the area’ of ‘what other municipalities are doing’ and it’s ‘old fashioned’ to ‘expect people to rock up’ to council meetings all the time. MAGEE: likes the idea but didn’t at first. Residents often ask ‘what happened at the council meeting?’ and he can’t always remember what was said. Recording would therefore be ‘an opportunity for people to look back at particular items’. Said that he’s been watching the videos of Kingston and Dandenong ‘and they are atrocious’ so ‘we would really have to lift our game if we looked like that’. In those council meetings the Mayor tells the gallery that it’s being recorded so there are legal questions that could be added to the report. Since the town hall is a ‘heritage building’ then every ‘infrastructure we put in we have to be very careful of’ and that ‘maybe we can’t facilitate’ the recordings. Thought that in 2013 ‘there is a need’ for recordings. LOBO: ‘excellent idea’ and it’s like a ‘performance report on a monthly basis from residents’. They can be seen by residents on ‘how we perform’. ‘We should not be scared’. ‘Directors have to be appraised by Andrew Newton’ and for councillors when people want to ‘look how they behave, professional or unprofessional’ then the recordings will tell them. ‘Even if a mayor acts unprofessional…has to be seen by the residents’. Residents ‘should know’ so when the elections come up they know (hand gestures) who to vote for (the implication). DELAHUNTY: would be amazed if there was any consequences about heritage. Couldn’t see how placing a tripod with a camera in the corner could be a heritage problem. Hoped that councillors would support the call for a report which was to tell them if they can do this and not the merits of doing it. Bye Bye, our right went decades ago, they’re only paper rights now, or paper writes. Why pay these bureaucrats huge sums of money to to be cynical human rights abusers. We need a council that will go through these chair warming cynics, sack the power hungry failures and place people in the positions that can do the the job of managing a community. It a bit early to see if our new CEO will be able to break through the decades on misogyny. The decaying garbage heaps lying around in just about every street and road that you care to pass through area a metaphor for Newton’s weakness to rid us of these under-performers that litter the town hall alcoves with nothing better to do than abuse residents with reams of equally offensive rubbish.